Business happens at the speed of “right now” across departmental, physical, geographical and organizational lines. Secure, anywhere, anytime access to the most up-to-minute business content ensures that employees, partners and customers can do business faster. Neither remote VPN access nor cloud-only sharing solutions provide the flexibility, security, and universal access required to support today’s business. What’s needed is a solution that offers the benefits of cloud-based file access along with the control and manageability of local file systems. 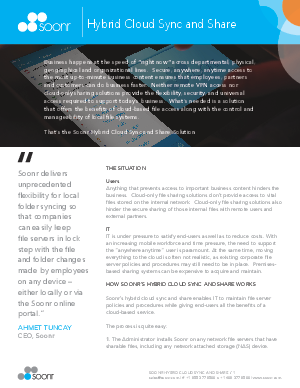 Discover the Soonr Hybrid Cloud Sync and Share Solution that preserves existing file server infrastructure, while delivering complete mobile file sharing and collaboration capabilities.